Much of the nation has noted with intrigue the events in Madison, WI this week. Gov. Scott Walker (R) and the Republican controlled Assembly and Senate are preparing to pass a controversial “budget repair bill” that, among other things, bans collective bargaining for public employees (including teachers). The bill notably exempts fireman and police officers. 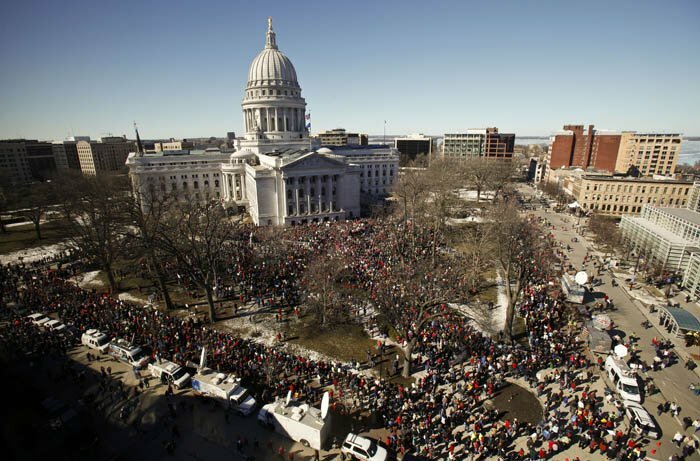 Tens of thousands have decended on Madison’s Capital Square to protest the bill, primarily motivated by the collective bargaining provisions. Democratic Senators have fled the state in an attempt to prevent a quorum (effectively a state-level fillibuster, except unlike at the federal level, you have to actually do something). All the attention to the collective bargaining provision by protestors is great. While I sometimes think public employee unions can be short-sighted in negotiations (and that on the teacher front, employing the best and brightest is advantageous to blindedly protecting seniority), the right for collective bargaining is essential to maintaining an effective and robust public work force, avoiding a run-to-the-bottom, insulating civil service from political whims, and protecting workers rights. That said, all the attention on collective bargaining runs the risk of under-emphasizing other really really bad parts of this bill. For example, The Cap Times had a great piece this morning discussing how the medicaid reforms in the bill could be disastrous, cutting medicaid benefits to 50,000 people, in a state with a strong history on healthcare and in an era when we should be finishing up the job of providing healthcare to all. The Medicaid provisions are particularly important given that Scott Walker’s new health department secretary has repeatedly suggested that states end Medicaid. Importantly, the bill itself doesn’t make cuts to Medicaid, but gives Scott Walker unilateral authority to do with Medicaid as he pleases. Presumably republican assembly and senate members would prefer not to be on the hook for such drastic changes, and Scott Walker appears more than willing to take the brunt. 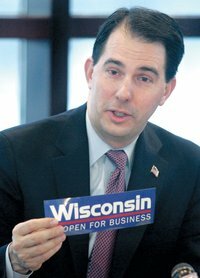 Wisconsin is open for business. But not the poor, working class, or unhealthy. This entry was posted on Sunday, February 20th, 2011 at 11:48 am	and is filed under Uncategorized. You can follow any responses to this entry through the RSS 2.0 feed. You can leave a response, or trackback from your own site.